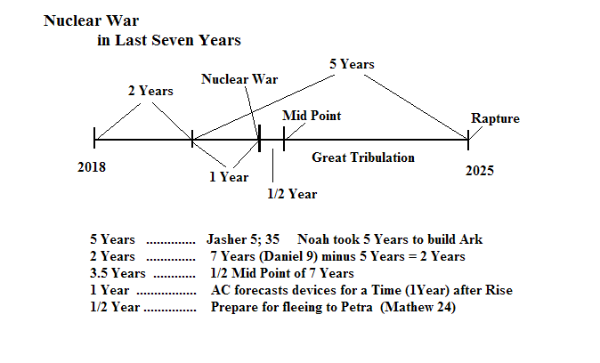 we must first Survive the Nuclear War that comes before the Great Tribulation. September 2018. This even before the Last Seven Years has started and the Mid East War broken out. Biblical Design of Petra, Sinai. etc. also the (2nd) Coming of the Son of Man be ... Mathew 24 : 37.
the Daily Sacrifice has started (outside the 3rd Temple). strongholds...... the opposing three nuclear nations of the US, Britan, and France. the strong holds, even for a TIME. occupy, his defeated foes as the nuclear war, and the chaos afterward would do the job for him. This in the middle of the last SEVEN YEARS, 3.5 years after the start of the conflicts, in Oct 2nd 2018.
because we have things to do, places to go, and battles to fight before we go.